Genetic engineering is the manipulation of a trait in an organism and modifying its DNA to have a certain characteristic. Genetic engineering is a recent discovery made by a company named Genentech, in 1976. This shows that genetic engineering is still at its beginning stage, but scientist have been able to do so much with this new technology in so little time. One of the inventions they did during the time of exploring this new discovery was fluorescent fish. GloFish were first launched back in 2003 and where a big hit, the people loved it. I believe GloFish is a positive application and should be able to be implemented because it is safe to the environment and safe for the fish itself, it’s used to find polluted areas and polluted organs in our body, and people love to keep them as pets. One of the reasons why I feel this application should be implemented is because making these genetically modified fish is safe for the environment and safe for the fish itself. When this application was first released there were many reports saying that this would be bad for the ocean and bad for the fish health. One of the rumors that were spreading after the launch of these fish was that they inject the fish and dyed them with the coloring to make them glow. This has been proven wrong, before the fish is born they inject the embryo with the specific trait. Once in the embryo it becomes part of the DNA of the fish just like the skin of it, it becomes part of it and is born with this trait. When people get bored of fish or don’t want them anymore the first thing they will do is flush them down the drain and these fishes go into the ocean. Many people were concerned for a genetically modified fish going into the ocean affecting many of the fishes in the nearby waters. Later reports though have said that this is not true. These fishes cause no harm because they have no way of surviving in the ocean full of predators when it’s constantly glowing, it would be really hard for these fishes to hide. The second why I believe these fish should be implemented is because it helps our health. The reason why these fish were created in the first place was because it was helping scientist determine polluted areas in the water. Also, these fish were being used to see where and how pollution affects us. 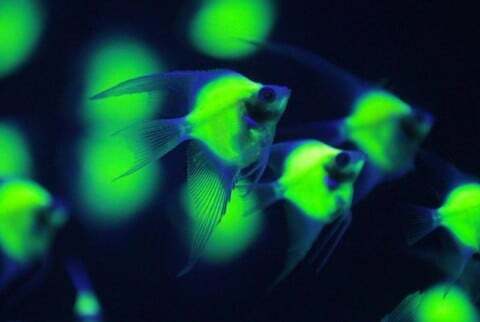 Scientist first started with first creating these fluorescent fish, using zebra fishes. The way it works is exposing these fishes to different type of pollutions, once these fishes are have absorbed the pollution the organs that have been affected, glows. This is also how they detected the polluted areas of water in the ocea. This shows that this application is helpful not just to the environment but also to the health of human beings. My last reason why this application should be implicated is because people love them as pets. These modified fish are called “design fish.” Before the launching of GloFish, scientist thought this would be a great thing for the public. Then in 2003 this application was first launched for the public. The care of a fluorescent fish is the same as a normal fish but with the better exception that the modified fish glow. Many of these fishes are used in at home aquariums and offices. These fish attract especially young kids that love the different type of color fishes because it is entertaining to the eyes. Although, many would claim that making these glow would make it hard for them to survive in the ocean once they get thrown down the drain. However, normal fish wouldn’t survive much time either, once they are in the ocean they are very small surrounded with big predators. Fluorescent fish are the same as normal fish but the only difference is that one of them glows. Pro, GloFish by Valeria is licensed under a Creative Commons Attribution-ShareAlike 4.0 International License.